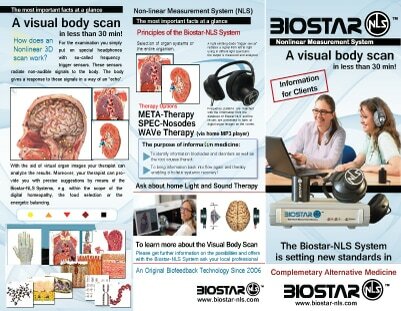 What is it like to get a Biostar-NLS scan? The session starts with a small-talk in order to relax you and allow the Bioenegetic Practitioner to get to know you. Simply place a pair of headphones on while a scan is run. During the scan, subtle spectral vibrations are detected from your body and are obtained from the headphones (within is a sensor) which measures the information or background noise around biological objects. 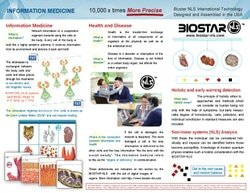 Your body will naturally respond to this communication and the Biostar software records each Add to dictionary oscillations. Although a few people may be able to sense this energetic communication, most are unaware that the scan is taking place. The length of the scan can be as little as 5 minutes. 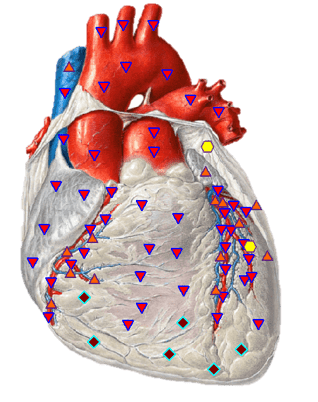 During this procedure 6 various states of cellular energy and their nearest tissues are displayed on as virtual models (on the display), using the special marker system. This makes possible for the specialist to identified problematic areas for a later detailed examination. *The images above are for reference purposes and is not intended to substitute for advice given by a physician, pharmacist, or other licensed health-care professional. You should not use this information as diagnosis or for treating a health problem or disease. Contact your health-care provider immediately if you suspect that you have a medical problem. Information and statements on this website have not been evaluated by the Food and Drug Administration, and are not intended to diagnose, treat, cure, or prevent any disease or health condition. A BioEnergetic Research Associate (BERA) examines all areas and organs which are identified as problematic in detail. 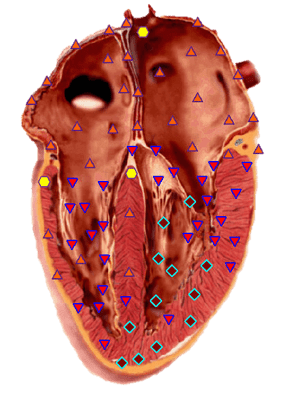 Intuitive interface and a system of horizontal slices make the detailed examination of particular organ (up to its cell structure) possible. Compared to traditional imaging technology, NLS-diagnostics is safe and non-invasive.